The following video provides a very good and simple explanation of Cloud Computing and explains the relationship to SaaS and Grid Computing. With all the hype today about Cloud Computing and SaaS, there is a lot of confusion and misinformation out there. GenoLogics and CLC bio today announced they will provide an end-to-end informatics and analysis solution, optimized for Next Generation Sequencing research that addresses both lab and data management and data analysis all within one integrated system. Accelerated Technology Laboratories, Inc. (ATL), leaders in Laboratory Information Management Systems (LIMS), is pleased to exhibit at the 2009 AWWA Water Quality Technology Conference and Exposition (WQTC) and demonstrate exciting new features in Sample Master® Pro LIMS and Sample Master® Result Point™ at Booth #306. Autoscribe announces the availability of a new software solution for all RadioPharmacy laboratories that may be further integrated with Autoscribe’s PET and Environmental Monitoring LIMS. 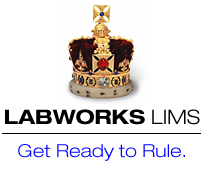 SaaS (Software as a Service) has arrived for the laboratory, scientific and health informatics community! Visit the website to read and post discussions, links, trials of SaaS applications for the scientific/lab/health industry and more.
) --Technology Vision Group LLC (TVG) announced at the 17th Annual BioPartnering Europe™ (BPE) conference in London, the launch of a new worldwide network of BioPartnering conferences that will span the globe. Ariadne is pleased to announce the release of Pathway Studio® version 7, Desktop Edition. Pathway Studio software is used broadly in Academia and Industry to facilitate research of molecular biology, experimental data analysis, drug discovery and development, and plant genomics research. Program offers license exchange of existing COTS (Commercial Off-the-Shelf), home grown and custom laboratory data systems for Biotracker™ LIMS licenses .